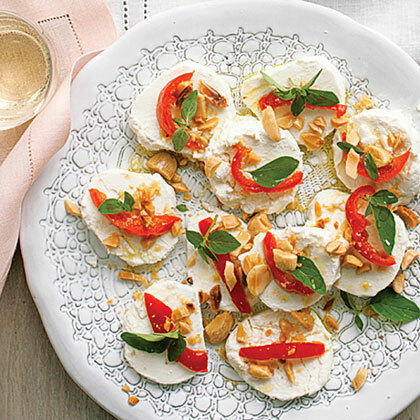 The balance of sweet, spicy, and salty flavors makes this an excellent appetizer to pair with a variety of wines. Tangy-sweet little red Peppadew peppers are key to the flavor combo. Slice cheese into rounds about 1/2 in. thick, dipping the knife into hot water between slices and wiping it clean. Arrange slices on a plate and sprinkle with peppers, almonds, and oregano leaves. Drizzle with olive oil and serve with crackers. *Find in the olive bar at well-stocked grocery stores.